Take care of that craving for chocolate chip cookies without the sugar and gluten! 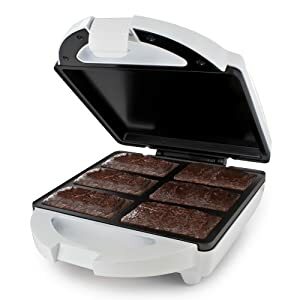 This recipe was designed for a counter top brownie bar maker, but should adapt well to using a muffin tin or brownie pan. There is no specific measurement provided for the chocolate chips because you will add the chips to the bars depending on your carbohydrate tolerance and the type of chocolate you use. In our test recipe, we used 60% cocoa Ghirardelli brand chocolate chips because that is what is available in our local market. Because these are higher in carbohydrates, only about 7-8 chips were added per bar. Adjust the number of chips to fit your carbohydrate needs. Mix all dry ingredients together. In a separate bowl, beat the eggs and then add the coconut milk and vanilla. Fold the egg mixture in to the dry ingredients and mix just until ingredients are blended. Let the batter sit for 2-3 minutes to allow the coconut flour to absorb the liquids in the batter. Stir one last time before portioning to a brownie bar maker or brownie pan. Cook according to manufacturer's directions. The bottoms and sides will become light brown, but the tops will not darken much. Be careful not to overcook.